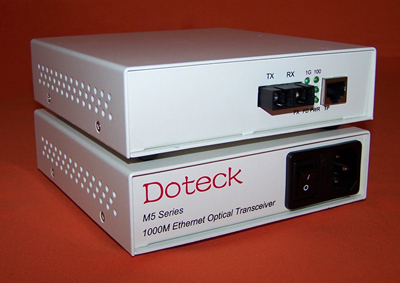 Doteck M5 series is a fiber transmission system used to convert electrical signals from the Gigabit Ethernet into optical signals and compatible to IEEE802.3z/AB standard. It can be used for data communication between 1000Base-FX optic cables or between 1000Base-T UTP and 1000Base-LC optic cable. It is suitable for the intelligence community building, or fiber-desktop connector. This unique device can be used to extend transmission distance from UTP transmission distance limitation 100m up to 10KM, even as far as 120 km. 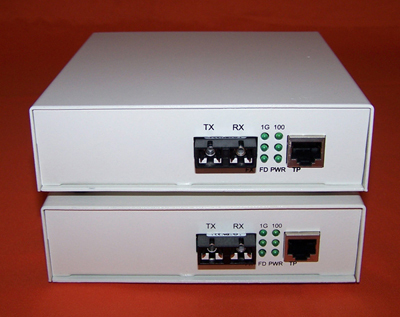 It can simply implement connecting a single server, repeaters, hubs, switches, terminals and an interconnection. Doteck M5 series is divided into pure Gigabit fiber optic transceiver and 10/100/1000M adaptive fiber optic transmission system. Pure Gigabit optical interfaces can only work in full-duplex mode, 10/100/1000M adaptive fiber optic ports operate in full-duplex working patterns, and the electrical interface is capable of operating at the rate of the 10M, 100M, and 1000Mbps.